We're combining our resources with RadioActivity, and building a new radio platform for college and community radio stations, called Creek. Creek has the same music-logging and reporting tools as RadioActivity, but adds new tools for radio websites. We are now working with current RadioActivity stations to migrate them to Creek over the 2017-2018 year. There is no additional charge — Creek is the same price for existing RadioActivity stations, and the migration is free. If you are a RadioActivity station, here is what you need to know. Creek is the same yearly price for existing RadioActivity stations. Stations paying for RadioActivity will receive a subscription to Creek for no additional charge. Then, after moving to Creek, your station will continue to pay the same yearly rate for the 2018-2019 year. We'll be helping each station migrate to Creek over the next year starting in July 2017. We are aiming to help all stations move to Creek by August 2018. But if you want to keep using RadioActivity longer, then that's okay — we'll work with you to set a later migration date. We'll also keep RadioActivity.fm itself running for a year or more, even after everyone is migrated, so that all of your archived links to historic playlists will still be available at the same URL (web address), so that you don't have to deal with broken links. We work with each station to set a migration date. Just let us know a good date for your station, and we'll give you a call on the phone, and walk you through the steps. It's best if the date is during a break period for your school or organization, and before new DJs come in for training. Then, they can start off in Creek, rather than having to train on two systems. 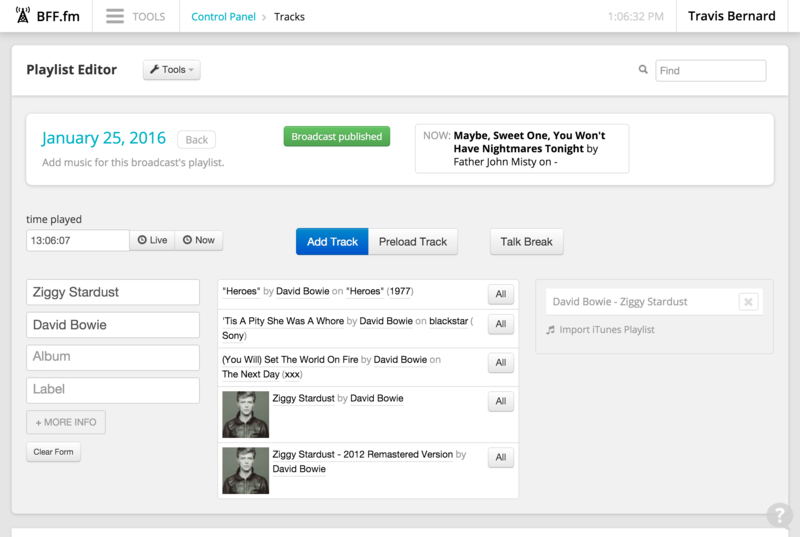 We import all of your RadioActivity data for shows, DJs, and playlists into Creek. You'll be able to start where you left off, with the same archived data. Just contact us about a demo, and we'll create one for your station. Our tools integrate with any website platform — not just WordPress. For example, see WXNAfm.org for a seamless integration with Squarespace. KUSF — college radio at UC San Francisco. WYBC — Yale's student-run radio station.